If you own a listed building or are looking for an alternative to PVCu windows, you might want to consider aluminium windows. With low thermal expansion and inherent strength coupled with precision engineering, aluminium offer an alternative suitable solution for both traditional and contemporary properties. Aluminium provide an enhanced slimline appearance and can be a direct replacement for Crittall-style windows, almost indistinguishable from the original. Aluminium can be successfully installed into listed buildings. Aluminium windows are available either as direct fix or with hardwood sub frames according to your preference and with a choice of colours. When looking for the perfect upgrade for your home aluminium windows are a great choice. Enhancing and complementing the look of your home, you can add a touch of style whilst also protecting your family from both the environment and unwelcome visitors. Aluminium windows from Warmlite offer narrow profiles and slim sight lines that can make a real difference to the look of your property. Aluminium is lightweight, strong and regarded as one of the most sustainable building materials available, being almost 100% recyclable. This inherent strength means that the security of your home is improved and there is no need to worry about warping or rust and it is almost maintenance free. You can choose from a vast array of colours to suit your home, including a dual-colour option where the inside and outside colours can be different. Aluminium Windows to suit every type of home and style. Here at Warmite we have a selection of Aluminium windows to suit almost any type of home. From traditional windows to modern contemporary styles we have a aluminium window that we enhance and secure your home. Our ovolo aluminium windows combine high performance design and a timeless profile to complement your home. Traditional style meets modern performance with our aluminium Chamfered profile windows. Our Heritage aluminium windows are a perfect sustainable replacement for your current steel windows. Our Aluminium Bay Windows offer a traditional look with clean lines to complement your home’s design. Our innovative contemporary window systems provide slim sightlines for a subtle, contemporary look. Our Panoramic windows are perfect for modern homes looking for a floor to ceiling glazing option. 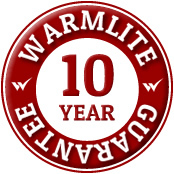 All Warmlite aluminium windows installations are covered by our 10 year guarantee. Plus you have the added assurance as you have a 10 year guarantee on all our Aluminium Window installations.